Thou Shalt Not Take "Selfies" with Our Lord. The Twelfth Sunday of Ordinary Time. • Zechariah 12: 10-11; 13: 1. • I Peter 3: 8-15. • Psalm 86: 10, 9. The Fifth Sunday after Pentecost; the Fifth Sunday of the Apostles Fast; and, the Feast of the Holy Apostle Jude, Brother of the Lord. • Matthew 8: 28—9: 1. 7:41 AM 6/19/2016 — I would like to begin today's homily with an apology of sorts. Over the last few years you've come to expect these Sunday homilies to be filled with all sorts of deep, theological insights, inspiring rhetoric, and Scriptural exegesis, some of which may have been of benefit to you, much of it doing nothing more than fueling my own sense of pride. But, whether for good or for ill, it's been a busy weekend here at the Shrine, and I've not been particularly well, so I'm just not up to being erudite today, which is probably a good thing. So, what you get today is what my parishioners used to get whenever I wasn't feeling good, which amounts to nothing more than a rant. Many of us are old enough to remember a time when the adoration of the Blessed Sacrament, visits to the Blessed Sacrament, respect for the Blessed Sacrament were parts of every Catholic's life. The tabernacle was the focal point of the church; one never past in front of it without genuflecting. Downstairs, in the Blessed Sacrament Chapel, we have a tabernacle fashioned according to Sister Lucia's description of the Angel of Peace who brought the children Holy Communion in 1916; and, you have no idea how painful it is to me to see people approaching it, trying to touch it, attempting to take “selfies” with it, because to them it's nothing more than some sort of statue of a pretty angel. It doesn't seem possible to me that they don't know it's the tabernacle containing the Body of our Lord, especially since there's a sign asking for silence in our Lord's presence. That's why, whenever we have large groups here, I usually close the glass doors which prevent access to the tabernacle, to prevent people who either don't know what a tabernacle is—or who don't care—from approaching what should never be approached. Since coming here to the Shrine I've done what I can to help foster a healthy respect for our Blessed Lord in the Eucharist, always providing the opportunity for people to receive Holy Communion kneeling, using lay people to help with Holy Communion only when necessary, and only calling upon those whom I have personally commissioned for that purpose. Receiving Holy Communion in the hand is allowed in this country, and I've no objection to it; but, people often don't understand that there is no right to receive in the hand; and, when someone approaches me with their hands held in something other than the appropriate manner, I refuse to place the host in their hands. Last year, a man attended Holy Mass here one day who was handicapped and not able to hold both his hands in the proper manner; and, when he held out one hand only, I placed the Host in his mouth. After Mass I approached him and tried to explain why I had refused the put the Host into his hand, but he wouldn't listen; he stormed out swearing he would never come here again, and he never has. But he was wrong and I was right: the fact that he was physically unable to receive properly in the hand is irelevant; and, for someone suffering from such a handicap, receiving in the hand is simply not available. That's all there is to it. All of this is just a symptom of what has become a general lack of respect for our Lord in the Blessed Eucharist which, after all, is Jesus: not a symbol of Jesus, not a sign of Jesus, but actually our Lord, God and Savior, Jesus Christ. 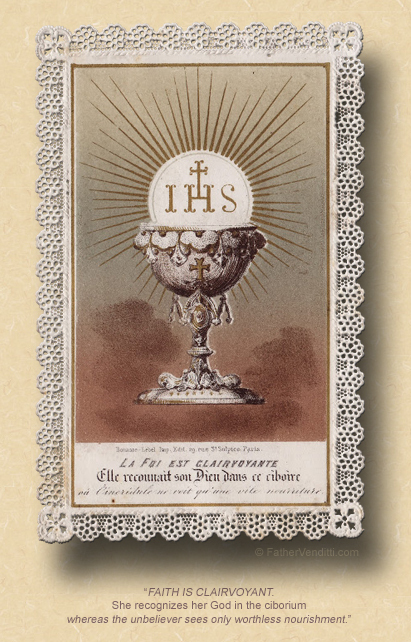 Respect and awe for our Lord in the Blessed Eucharist used to be instinctive of every Catholic, but it seems not to be anymore; and, if it seems to us sometimes that it is a thing of the past, why is that? Where is it written—in the decrees of Vatican II, in the preaching of the recent popes, in the new Catechism of the Catholic Church—that these things are no more? No where. If they are part of Catholic life no more, it's because we've failed to cultivate them in our own lives and pass them on to our children. What shall we do, you ask, in the presence of the Blessed Sacrament? … What does a poor man do in the presence of a rich man? A sick man in the presence of a doctor? One who is thirsty at the sight of a crystal-clear fountain? 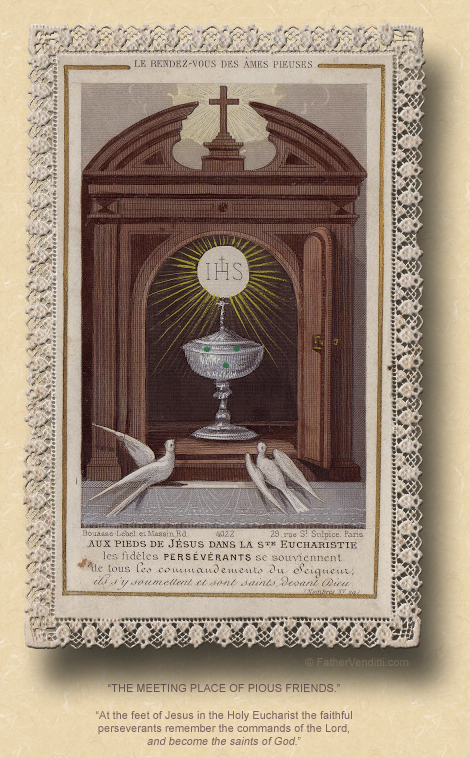 (Visits to the Blessed Sacrament, Introduction, III). And to that we can easily add another analogy: what does a hungry man do in the presence of bread? Only the bread that is being placed before us at Holy Mass isn't bread, it only looks like it. It's our Lord in disguise. He offers Himself as food, not food to fill the belly, but food to fill the empty heart, food to fill the soul. Today's Gospel lesson begins with the verse: “Once when Jesus was praying in solitude, and the disciples were with him, he asked them, 'Who do the crowds say that I am? '” (Luke 9: 18 NABRE). Every word in that sentence is important, beginning with the fact that our Lord was “praying in solitude.” Jesus is giving us an example of what to do when at prayer, and the question he asks His disciples tells us the result: when we seek out our Lord in the tabernacle in a spirit of silence, uncluttered by books or beads or multiplication of words, He is able to speak to us rather than us speaking to Him, and He is able to show us who we really are. The spiritual doctors of a previous age used to call this the Prayer of the Presence of God: putting ourselves in God's presence and just being there with Him. Saint Ignatius, in The Spiritual Exercises, begins every exercise by asking us to place ourselves in the presence of God, no matter where we are. Saint Josemaría Escrivá has a prayer he recommends before any act of meditation, which begins: “My Lord and my God, I firmly believe that You are here, that You see me, that You hear me.” And that alone is enough of a prayer all by itself. There are all kinds of things we can do when we pray to purge our minds of distractions and give us seeds for fruitful meditation, all kinds of books we can use and aids to help us. The Holy Rosary is one of the most important. But there needs to be some time every day when we are truly alone with our Lord so that He can speak to us. All the better if we can do it in His very presence before the tabernacle. Every Sunday, whenever the weather cooperates and we are able to have Holy Mass outside, and I transfer the Blessed Sacrament from the chapel downstairs to the tabernacle here, it's always instructive to notice who pauses whatever they're doing to kneel as our Lord passes by, and who just goes on about their business. In today's Gospel lesson, our Lord, predicting his Passion, says, “The Son of Man must suffer greatly… (Luke 9: 22 NABRE), and I think He does suffer greatly every time someone ignores His very Presence in the Holy Eucharist, attempting to receive Him without having confessed, or without being properly disposed, or attempting to receive in an improper or casual way. There was a time when respect for the Blessed Sacrament was so instinctive to the average Catholic that, whenever one was driving and past a Catholic Church, one always blessed oneself out of respect for the fact that, inside that Church, one always knew that the Blessed Eucharist was reserved in that church's tabernacle. There is something to be said for that.